The last-and most lethal-of his kind . . . Wild, uncontrollable, and powerful, the lion-shifting Rakshasa were hunted down by vicious rival vampires who feared their dark, magical abilities. Somehow one survived, and now, after centuries of hiding, Tasmin Singh reemerges as fierce and fearless as ever at the door of the Lilim queen, seeking answers . . . and sanctuary. I had been wanting to read this book since I read the first chapter at the end of Shadow Rising (Dark Dynasties #3). So did it live up to my expectations? Yes, mostly. 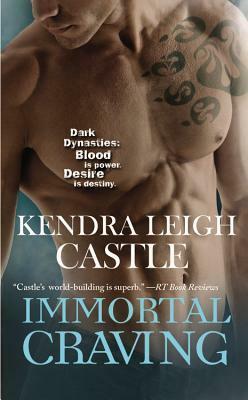 I love, love, love Kendra Leigh Castle's world building! If you like a series to be in-depth, with detailed characters set in a unique (paranormal) world, then you'd really enjoy this book. I liked Tasmin's character immediately. His race the Rakshasa, once powerful and revered, has been decimated. He awakes from sleep in a cave only to find out he's slept away centuries, and is now the only surviving Rakshasa. Tasmin, feeling so alone, quickly begins to rely on Bay and it was interesting to see their relationship play out. So, in a nut-shell, what didn't I like? The characters fall in love really quickly, and it took some time for me to feel it too. Granted in romance the characters fall in love quickly all of the time and normally that doesn't bother me if there is a good reason for it, but with this book I just didn't feel it at first. I didn't enjoy it as much as Shadow Rising, but as the book progressed I did end up enjoying it immensely. I love a big in-depth world/series to explore, and this is a really good one. The story is really good, and I hope there are a few more books to find out what happens with the overall story. If you haven't read the other books, I recommend reading them first because you might be a little lost. Even though I liked Shadow Rising better, this is still a really good installment in this series, and I can't wait to read more!